Fumarolic activity, accompanied by low-intensity seismicity, was described by policemen from Ujina, 15 km SW of Olca, on 13 November 1989. Minor seismicity associated with Olca was noted in mid-March 1990 by state oil company (ENAP) geologist Patricio Sepulveda. Information Contacts: J. Naranjo, SERNAGEOMIN. The Global Volcanism Program has no Weekly Reports available for Olca-Paruma. A 15-km-long E-W ridge forming the border between Chile and Bolivia is comprised of several stratovolcanoes with Holocene lava flows. Andesitic-dacitic lava flows extend as far as 5 km N from the active crater of Volcán Olca and to the north and west from vents farther to the west. Olca is flanked on the west by Cerro Michincha and on the east by Volcán Paruma, which is immediately west of the higher pre-Holocene Cerro Paruma volcano. Volcán Paruma has been the source of conspicuous fresh lava flows, one of which extends 7 km SE, and has displayed persistent fumarolic activity. The only reported historical activity from the complex was a flank eruption of unspecified character between 1865 and 1867, which SERNAGEOMIN notes is based on unconfirmed records. There is no Deformation History data available for Olca-Paruma. There is no Emissions History data available for Olca-Paruma. 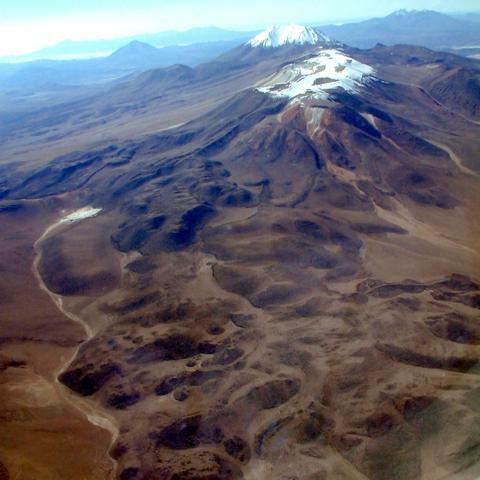 The Olca-Paruma volcanic complex, seen here from the west, forms a 15-km-long E-W ridge forming the border between Chile and Bolivia and is comprised of several stratovolcanoes with Holocene lava flows. Volcán Olca lies near the western end of the complex. It is flanked to the east by Volcán Paruma, which is immediately west of the higher pre-Holocene Cerro Paruma volcano, the conical peak in the background. Volcán Paruma has been the source of conspicuous fresh lava flows and has displayed persistent fumarolic activity in recent years. Photo by José Naranjo, 2001 (Servico Nacional de Geologica y Mineria). Large Eruptions of Olca-Paruma Information about large Quaternary eruptions (VEI >= 4) is cataloged in the Large Magnitude Explosive Volcanic Eruptions (LaMEVE) database of the Volcano Global Risk Identification and Analysis Project (VOGRIPA).